Taking aspirin, a commonly used pain reliever and anti-inflammatory drug, can help to reduce a person’s risk of cardiovascular events, such as heart attacks (myocardial infarction) and strokes. For many years experts have strongly recommended daily aspirin for most people who have had prior heart attacks or strokes, and clinical studies have demonstrated significant improvements in their outcome with aspirin. But the same experts have gone back and forth over the question of whether people who haven’t had a heart attack or a stroke, but who have significant risk factors for these events, should also take aspirin prophylactically. An analysis of the available data, published in 2019, shows that aspirin can indeed reduce cardiovascular risk in such people — but only at the cost of substantially increasing the risk of life-threatening bleeding. Heart attacks and strokes often occur when a blood clot suddenly forms within one of the arteries that supply oxygen to the heart or brain. These abnormal blood clots generally occur when a plaque ruptures in the wall of an artery. The clot can obstruct the flow of blood, which produces damage to the heart (a heart attack) or brain (a stroke). Aspirin inhibits the formation of these dangerous blood clots by interfering with the action of blood platelets, and thus can help to prevent heart attacks and strokes. Furthermore, in the past few years, evidence has accumulated suggesting that long-term low-dose aspirin therapy may reduce the risk of dying from cancer. The combination of cardiovascular risk reduction and cancer risk reduction makes low-dose aspirin a potentially attractive form of preventive medicine — if side effects can be avoided. The potential benefits of aspirin must always be weighed against the potential side effects. The chief side effects of aspirin are stomach upset and bleeding — nosebleeds, gastrointestinal bleeding, and bleeding in the brain (hemorrhagic strokes). Clearly, aspirin-induced bleeding can be life-threatening, and this is the issue that makes prophylactic aspirin controversial. Certainly, a person with an increased risk of bleeding (such as a history of peptic ulcers or of hemorrhagic stroke) should try to avoid aspirin. But potentially life-threatening bleeding from aspirin cannot always be predicted ahead of time, and anyone who takes this drug has at least some increased risk of bleeding episodes. 1) Aspirin can be life-saving in people who are having acute coronary syndromes. Anyone who thinks they are having a heart attack should take 162 or 325 mg of aspirin immediately (which is one-half or a whole adult aspirin tablet). 2) Aspirin is strongly recommended in people who have had prior heart attacks, have angina, have received angioplasty or stents, or who have had coronary artery bypass surgery. In these individuals, between 75 and 100 mg of aspirin a day can help prevent further heart attacks. 3) Aspirin is recommended for many (but not all) people who have had recent strokes or a transient ischemic attack (TIA, or “mini-strokes”). Some strokes are caused primarily by bleeding into the brain, instead of by blood clots within arteries, and aspirin is generally not recommended for that kind of stroke. If you have had a stroke or a TIA, you should talk to your doctor about whether aspirin would be of benefit to you. What about aspirin for primary prevention? Using aspirin in people who do not have overt heart disease, but have an elevated risk of having a cardiovascular event, is called primary prevention. It has been known for many years that daily aspirin can improve cardiovascular outcomes in these people — but the magnitude of benefit is less than it is for those with established cardiovascular disease. So, in these people, the potential benefit of aspirin may be outweighed by the potential risks. 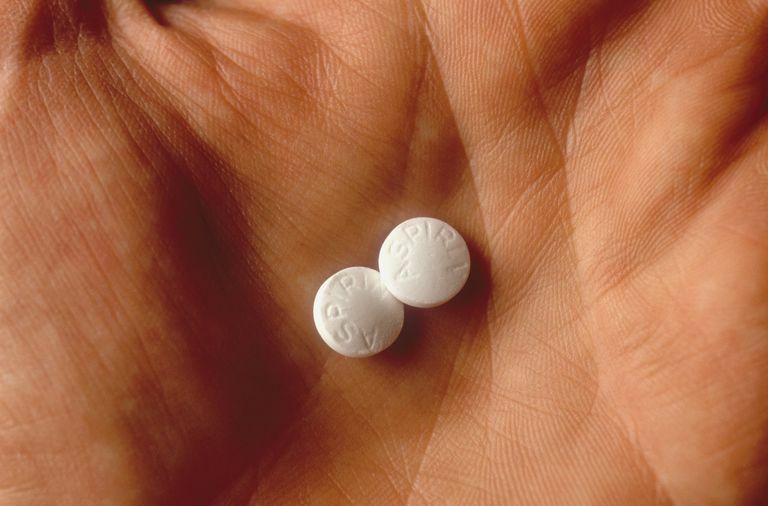 A meta-analysis of 13 clinical trials, reported in 2019, confirmed that when aspirin is used for the primary prevention of heart attacks and strokes, it can be modestly effective. People at increased risk for cardiovascular disease who were randomized to aspirin therapy had a modest 11% reduction in cardiovascular events — but they also had a 43% increase in major bleeding episodes (serious GI bleed, intracranial bleed, needing a transfusion or needing hospitalization). The probabilities of an individual having a benefit vs. a harm from aspirin in this analysis were roughly equivalent. In 2018, a study published in The Lancet suggested that the typical low-dose (75–100 mg) of aspirin that has been widely used for primary prevention is effective only for people weighing less than 70 kg (about 154 pounds). It makes sense that the optimal dose of aspirin may be related to body size, and that people who weigh more than 70 kg may need full-dose aspirin to realize a reduction in risk. Perhaps if an “optimal” dose of aspirin were used the ratio of harm vs. benefit would be improved. The studies that would be needed to evaluate this hypothesis have not been conducted yet. Based on these more recent studies, in early 2019 the American Heart Association and American College of Cardiology guidelines on prophylactic aspirin were changed. For people who have no cardiovascular disease, low-dose aspirin is now generally NOT recommended, unless their cardiac risk is judged to be very high, and their bleeding risk is judged to be low. In addition, the new guidelines specifically say that prophylactic aspirin should not be used in people over 70 years of age unless they have established heart disease, or diabetes (see below). People with diabetes who have had heart attacks, angina or stroke should take aspirin just like anyone else who has had these cardiovascular events. And until recently, daily prophylactic aspirin was also strongly recommended for most diabetics over the age of 40, even if they had no history of cardiovascular disease. But this recommendation has now changed. Based on information from recent clinical trials, the American Diabetic Association, the American Heart Association, and the American College of Cardiology now recommend prophylactic low-dose aspirin (75 - 162 mg/day) only for diabetic men over the age of 50, and diabetic women over the age of 60, who have at least one additional risk factor for cardiovascular disease (in addition to diabetes), such as a strong family history of cardiovascular disease, smoking, increased blood lipids, or high blood pressure. This more conservative recommendation for those with diabetes is related to new evidence that gastrointestinal bleeding with aspirin may be more common in people with diabetes. In recent years, several studies have suggested that taking daily low-dose aspirin over a long-term (at least 5 years) is associated with a reduced risk of dying from cancer, particularly colon cancer and lymphoma. The potential for aspirin to reduce cancer risk is leading to (yet another) re-evaluation of the general recommendations on prophylactic aspirin therapy. For instance, largely because of the combined cardiovascular and cancer benefits of low-dose aspirin, in 2012 the American College of Chest Physicians (ACCP) recommended that virtually everyone over the age of 50 should take low-dose aspirin — unless they have an unusually high risk of bleeding. While the position of the ACCP may well end up being adopted by other expert groups, currently the ACCP is the only specialty organization which has jumped to this sweeping recommendation. Other specialty organizations and expert panels (such as the United States Preventive Services Task Force) still urge caution (because of the risk of bleeding), and strongly recommend that patients and their doctors decide on an individual basis whether prophylactic aspirin is a good idea. In the right circumstances aspirin can be a major help in preventing serious cardiovascular events such as heart attack and stroke, and it may reduce the risk of dying from some types of cancer. Unfortunately, the risk of serious bleeding with prophylactic aspirin appears to often outweigh the potential benefit for most people. Consequently prophylactic aspirin is currently not recommended for most people. If you have significant risk factors for cardiovascular disease, however, this is still an issue you ought to discuss with your doctor. Seshasai SRK, Wijesuriya S, Sivakumaran R, et al. Effect of aspirin on vascular and nonvascular outcomes: meta-analysis of randomized controlled trials. Arch Intern Med 2012; DOI:10.1001/archinternmed.2011.628. Pignone M, Alberts MJ, Colwell JA, et al. Aspirin for primary prevention of cardiovascular disease in people with diabetes. Circulation 2010; DOI:10.1161/CIR.0b013e3181e3b133. Wolff T, Miller T, Ko S. Aspirin for the primary prevention of cardiovascular events: an update of the evidence for the U.S. Preventive Services Task Force. Ann Intern Med 2009; 150:405. Vandvik PO, Lincoff AM, Gore JM, et al. Primary and secondary prevention of cardiovascular disease: Antithrombotic Therapy and Prevention of Thrombosis, 9th ed: American College of Chest Physicians Evidence-Based Clinical Practice Guidelines. Chest 2012; 141:e637S.